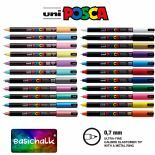 ​​​​​​​easichalk has the UK's largest selection of Posca paint markers including many unique packs and sets. 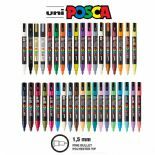 Posca paint pens are water based acrylic paint markers that can be used on all surfaces including wood, glass, ceramic, rocks, pebbles and more. 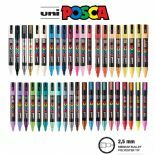 ​​​​​​​Posca paint markers come in 8 different sizes, PC-1MR extra fine 0.7mm tip, PC-1M extra fine 1mm, PC-3M 1.5mm, PC-5M 2.5mm, PC-7M 5.5mm, PC-8K 8mm, PC-17K with a jumbo 15mm tip and finally PCF-350 with a brush tip for full creativity. They are available in over 55 colours and can be bought individually, or in one of the many packs we have put together.